A routine stint of bedroom peeping sets jet-set New York lawyer Stone Barrington against an international assassin with more disguises than a barrel of cross-dressing monkeys. A clause Stone inserted into Lawrence Fortescue’s prenuptial agreement with Elena Marks will cost him any claim on her assets or income if he’s caught in flagrante, so when Elena gets wind of her bridegroom’s latest assignation, she wants film at 11. Because Stone doesn’t do such distasteful jobs himself, he hires photographer Herbie Fisher to get the evidence, then has to take care of Herbie when he phones from the local precinct after the skylight he was leaning on collapses, sending him hurtling down atop Larry’s dead body. The real story here, however, isn’t Herbie or even Larry, but Larry’s companion, who fatally poisoned him (why?) just before Herbie dropped in and then took a powder herself. As Felicity Devonshire, the British agent Stone got to know as Carpenter in The Short Forever (2002), points out the morning after her bedroom exercise with Stone, the subject of Herbie’s art hasn’t been photographed since she was 12—eight years before British Intelligence killed her parents in a botched operation and she swore revenge. Now Marie-Thérèse du Bois (to give her the real name she uses only in the coffee breaks between chameleon changes of identity) has already murdered three of Carpenter’s colleagues, and, as subsequent events demonstrate, she’s only warming up. 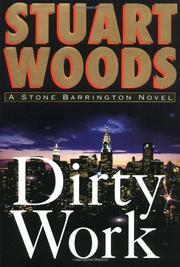 As in The Short Forever, but much more successfully, Woods keeps changing gears from one plotline to the next—Get the Pictures, Find the Woman, Broker the Meeting, Contain the Damage—so that, although no breath of reality ever disturbs the air of deluxe action, the tale puts both Stone and the reader through some exhilarating paces. A crisp, fleet timekiller: the fashionplate lawyer’s best outing since Dead in the Water (1997).